U.S. Sen. Ted Cruz rolled back into New Hampshire Tuesday, attacking Donald Trump, berating reporters and delivering an imaginary state of the union address. LONDONDERRY, N.H. — Ted Cruz on Tuesday ended his two-month absence from this early voting state with a provocative tour that featured him ratcheting up his rhetoric against all the usual suspects and a less frequent target: his chief rival for the Republican presidential nomination. Over just seven hours on the ground here, the U.S. senator from Texas debuted a more antagonistic stance toward billionaire Donald Trump, whom he has been resistant to criticizing for months as the two have emerged as the top contenders for the nomination. In campaign events and media appearances, Cruz made clear his kid-gloves approach to Trump is over, sketching multiple lines of attack that could shape the final few weeks before the nominating contests start. It began Tuesday afternoon in Hudson, just over the Massachusetts border, when Cruz told reporters after a pro-gun rally that it was curious Trump was citing a liberal, pro-Hillary Clinton law professor to raise questions about his citizenship. It makes one wonder, Cruz mused, whether Democrats were propping up Trump because they did not want to face Cruz in the general election. In the same exchange, Cruz was asked about Trump playing the song "Born in the USA" at recent rallies, possibly as a way of ribbing Cruz over his Canadian birth. Not missing a beat, Cruz suggested another ditty for Trump events: "New York, New York." 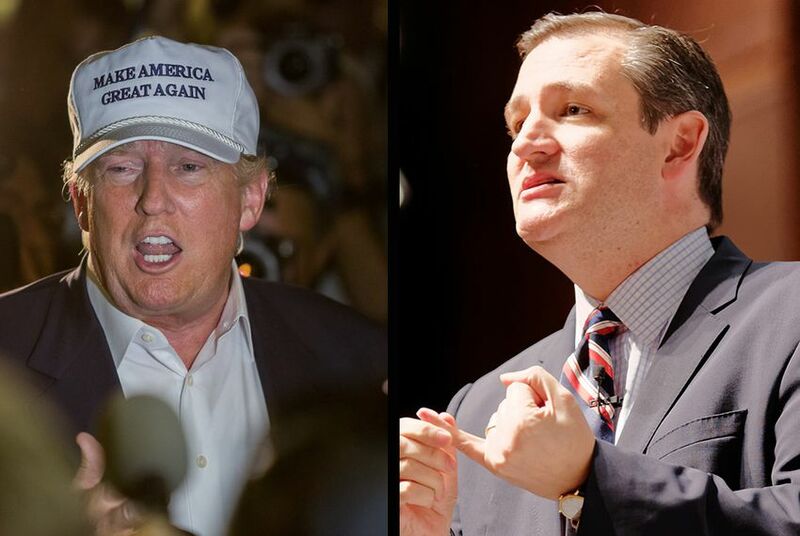 “Donald comes from New York, and he embodies New York values," Cruz said. "And listen, the Donald seems to be a little rattled." In another radio interview from New Hampshire, Cruz took a dig at Trump's foreign policy expertise, telling conservative host Hugh Hewitt that America needs a president who knows how to defeat the Islamic State terrorist group "not just based on what’s said on Sunday shows on TV." Asked in August where he gets military advice from, Trump memorably responded "the shows." By the time Cruz took the mic at a standing-room-only town hall Tuesday evening in Londonderry, a snowstorm raging outside, he was showing no reservations about dinging Trump on matters serious and not. He appeared to have the billionaire on his mind when he warned the crowd about the specter of a "New York gazillionaire" doing business with Clinton, and he flatly mocked one of Trump's signature lines on the stump. "It's not gonna be us just winning and winning until you're tired of winning," Cruz said of the United States under his administration. “There’s also this little thing called the Constitution." His remarks at Londonderry High School were otherwise a response of sorts to President Barack Obama's final State of the Union address, imagining what his own State of the Union speech would sound like after a year in office. He forecasted the completion of many well-known campaign promises, punctuating each with generous helpings of political incorrectness. After a Cruz administration shuts down the U.S. Department of Education, liberal megadonor George Soros would replace it with the "William Jefferson Clinton Museum of Youth Outreach," Cruz said. He also vowed a President Cruz would help terrorists meet their 72 virgins pledged to them by the Muslim holy book the Quran. "By the way," Cruz added, "no one promised those virgins would be women." Aside from some nervous laughter at his edgier jokes, Cruz's crowds scarfed down the red meat, thrilled with the senator's anti-establishment zeal and willingness to stand up to his own party. "I'm a conservative," said Tim Kerins, a retired teacher from Sutton, Massachusetts, who came to see Cruz in Hudson. "Unfortunately, my party has disappointed me, and he's one of the few people who hasn't." It was at the rally in Hudson, held outside a gun range in 32-degree cold, where Cruz's day began with chaos. Moments after he took the stage, a young man joined him and began ranting at the audience for attending an event celebrating firearms. A second agitator also made his presence known. "This is not your stage," Cruz sternly repeated to the interrupters, mocking them as coddled college students before tying them to Hillary Clinton's chief rival for the Democratic nomination. "Boy, it's almost like the Bernie Sanders guys are scared. The Bernistas are out in force!" As reporters huddled around the protesters to get more information, Cruz did not let the opportunity to bash the media go to waste, asking the crowd to notice how reporters "gather around the lefties who want to strip our rights because those are their values." Cruz continued to berate reporters from the stage as audience members hurled insults at the hecklers, who were eventually escorted off the premises. The two protesters, who provided their names as John Nelson and Robert Stiefler, told reporters they were with a group that wants to arm every American over the age of 16. They insisted their crashing of the rally was not "performance art," as one reporter suggested. Cruz's raucous return to New Hampshire marked his first trip to the state in 61 days, a relatively long absence that has not been lost on his GOP rivals. Speaking with reporters in Hudson, Cruz brushed off any concerns about his viability in the Granite State, saying his support there has been "steadily, gradually increasing" on a daily basis. "The poll that matters is the vote on Election Day," Cruz said. "I am encouraged that polling consistently in New Hampshire has shown me in essentially a tie for second place." Cruz's campaign is increasingly seeing an opening in the state, where support for more moderate candidates is splintered with just under a month left until the Feb. 9 primary. While New Hampshire has a history of unfriendliness toward White House hopefuls like Cruz, his supporters in the state say he has a chance to reverse that trend. "Our expectations — we're playing a game to win. There's no doubt about it," said former U.S. Sen. Bob Smith of New Hampshire, who co-chairs Cruz's campaign in the state. "The moderates here, as they are elsewhere, are split, so we don't have a clear establishment favorite like [Mitt] Romney was in 2012. So if the conservatives unite, we can win this thing here." Seijah Drake, a member of Cruz's "strike force" of volunteers stationed in the Manchester area, did not seem worried about Cruz's limited presence so far in New Hampshire. After all, many voters in New Hampshire still seem to be mulling their options, she said. "I haven't met a lot of people that have made their decisions, and I've met a lot of people that have him in their top three," said Drake, a college student from Boston. Asked whom she has observed as Cruz's closest competitor in the Granite State, Drake replied without hesitation, "Mostly Trump."